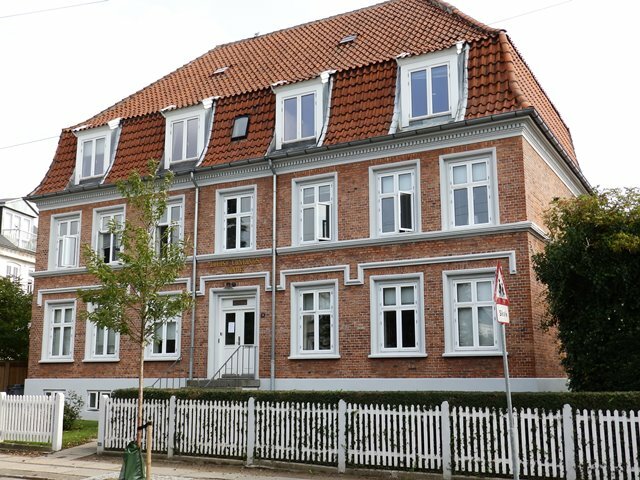 The residence on Kongens Tværvej is situated in Frederiksberg, a peaceful and picturesque residential area of Copenhagen. Frederiksberg offers a great variety of green areas, cafés, and shops. The building is a typical example of an old and charming Copenhagen villa. Frederiksberg offers a great variety of parks, cafés and shops. Kongens Tværvej Kollegiet is also located close to public transportation - and to CBS. There are three floors with 6 rooms on each floor. There is a back courtyard with garden furniture. "Kongens Tvaervej is a really small residence (for only 18 people) and that's what makes it special. All the students in here are like a big family and the shared kitchen is a great place for having a chat with the others while having dinner or a cup of tea." Bathrooms are shared - there are three bathrooms on each floor. There is one basically equipped kitchen per floor. The kitchen is small, but very cozy with a dining area. Washers and dryers are located in the basement. The cost is included in the rent. Basic internet is WiFi. Computers and cables are not provided. Kongens Tværvej is located within walking distance of CBS. All CBS buildings can be reached by bike (5 - 10 minutes) or by bus (10 minutes). There is space in front of the residence to park on the street, but it is very limited.